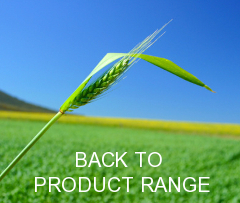 Bloat - Drench is a Ready - for - use product that is based on a Speciality Surfactant. Bloat is commonly caused in cows by the formation of a stable foam in the rumen which traps the gases produced during the fermentation process. The accumulation of gases produces a distension of the rumen (bloat) which can lead to a decrease in pasture intake and consequently milk production. If left untreated the cow may die from the effects of bloat. 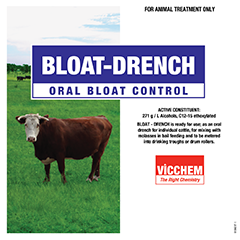 BLOAT-DRENCH contains a speciality surfactant (Teric*) that prevents formation of the stable foam that causes bloat. This product can also assist in breaking down foam that has already formed. Drench individual animals with 21mL of Bloat-Drench twice daily.